Welcome to Fish Window Cleaning Sterling Heights, Warren, Grosse Pointe, Fraser, Clinton Township, Saint Clair Shores, Roseville, Detroit, Grosse Pointe Shores, Grosse Pointe Farms, Grosse Pointe Park, Grosse Pointe Woods, Eastpointe, and Harper Woods, MI. We are your local window cleaning professionals and we'll make your home or business sparkle. Whether you're looking for services for your home or your business, you deserve a reliable window cleaning company with a team you can trust to get the job done right. With Fish Window Cleaning, that's exactly what you'll get. A member of our professional, uniformed staff will be happy to recommend a program that works within your needs, budget, and schedule. Call (586) 218-6464 or click on the green Free Estimate button above to request an estimate today! 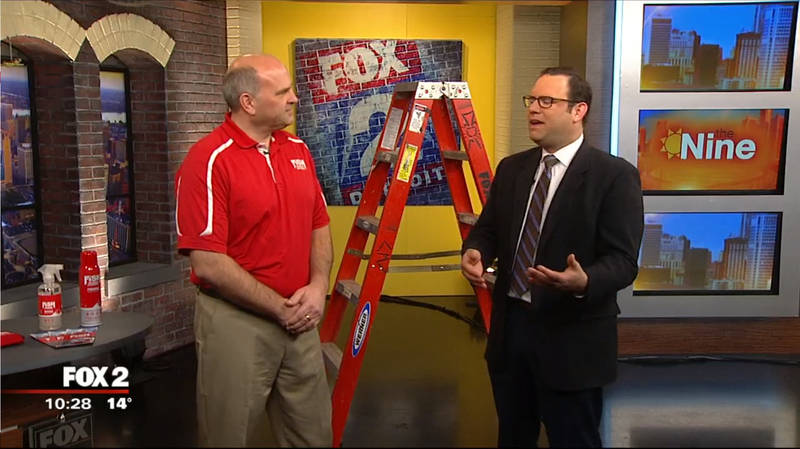 Check out Paul Megge, owner of Fish Window Cleaning Fraser, MI, discussing ladder safety tips on Fox 2 Detroit below! We know that your home and everything in it is important to you. That's why we take the utmost care while making your windows sparkle. We wear clean shoe covers while inside your home and even use absorbent cloths pads underneath your windows as we clean. Our team is trustworthy, uniformed, and friendly. We are also bonded and insured so when you hire FISH, you don't have to worry about a thing. All you need to do is sit back and enjoy your new, clear view. Click here for more information about our residential window cleaning services. We understand that the needs of businesses vary. We clean all types of windows in restaurants, showrooms, sales floors, churches, office buildings, and more. We'll customize our services to meet your needs, budget, and schedule. We also provide the added peace of mind that bonded and insured window cleaners will be maintaining the appearance of your business all year long. Click here for more information about our commercial window cleaning services.